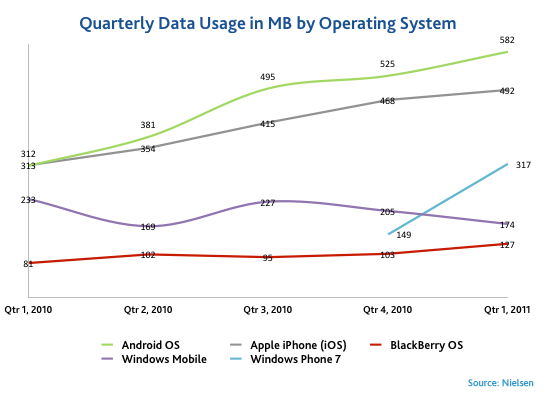 The average Android user utilizes 582MB (or roughly .6GB) of data per month - far less than what is allocated by any of the major carrier's plans. We often hear about consumers becoming feisty over data plan tier-ification or throttling, but how many people do these caps and throttles actually affect? 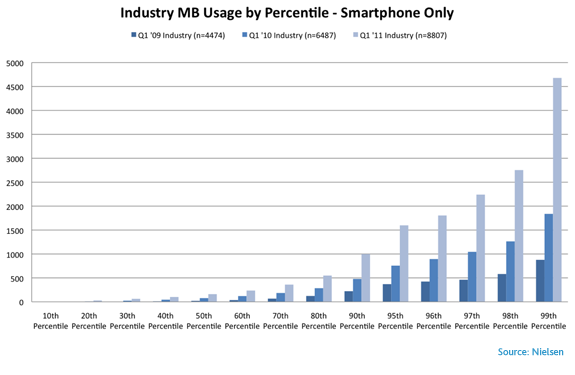 According to Nielsen, less than 3% of smartphone users average data consumption exceeding 2GB per month. Now, this is combining all platforms - though Android obviously makes up the majority. The top 1%, though, exceed 4GB each month. Now, I'm happy to admit I consume about 2.5-3GB of data each month that AT&T is perfectly content to charge me an additional $10 for using, bringing my monthly data costs to $35. It's not exactly cheap. But I rarely find myself thinking "Gee, data tiers are universally bad for consumers and rip everyone off." Why? Because I know I'm in the vast minority in regard to my data habits. I stream high-quality MP3's through Subsonic on a near daily basis. I use Pandora 10 hours or more a month. I send ridiculously large e-mail attachments with photos and screenshots. And I'm on the nation's most data-restrictive carrier. Why, then, does it seem that the entirety of the Android-using community has a foaming-at-the-mouth hatred of data tiers? I've always thought that the "vocal minority" theory was the culprit, and Nielsen's figures have finally given that theory legs (in my mind, at least). If the average Android user really is only sucking up 600 megs or so every month, then the adoption of tiers will only have a positive effect on the average user's service (and might even lower their monthly bill). It's not a hard conclusion to reach - many heavy users, in light of data tiers, will curb their excessive consumption habits, freeing up bandwidth for those who use less in the first place. Of course, there's the counterargument - "how much impact is that top 1% really having on the network?" And that's a question I don't think anyone but the carrier's network technicians or those privy to what is probably pretty well-protected data can answer completely. It's certainly some impact, though. When I read comments about Verizon LTE users drinking down 40GB of data because of the free Mobile Hotspot promotion, I start to see things from the carriers' point of view. But more than anything, tiers have a psychological effect - people think about when they're using data, and rather than upload those 30 photos from your niece's second cousin's 5th birthday party to Picasa while you're on 3G as you listen to Pandora and stream YouTube videos of cats doing hilariously adorable things while you're driving on the freeway, you might wait until you get home to the Wi-Fi network. Just maybe.